"Forget this image," says Dimitra Papagianni, pointing at the depiction of human evolution projected behind her: an ape crouched on all fours, followed by the early hominids carrying rock tools and spears, walking ultimately to the modern human form. While the image is iconic, Papagianni explains that the casual saunter from species to species doesn't do justice to the 2-million-year epic story of how modern humans beat out their Neanderthal cousins to survive and thrive in the bitterly cold lands of modern day Europe. Last Wednesday Papagianni, a researcher from the Centre for Archaeology of Human Origins at the University of Southampton, gave the inaugural seminar for the newly minted Center for Climate and Life at Columbia University and the Lamont-Doherty Earth Observatory. In her talk, titled "The Neanderthal Paradox," she explained the differences between the Neanderthals, a species that went extinct, and the ancient humans, our tropical-adapted forebears that would defy all odds and usurp Neanderthals as they migrated from Africa and into the chilly north. It was a talk that wove together culture, climate change, genetics and evolution. Overall, it was an apt introduction to usher in this new division of Climate and Life. Though they were closely related, Neanderthals and ancient humans were different species. Papagianni compared the skull of a Neanderthal to that of a human. The difference is clear. "Think of the skull of a human as a soccer ball, and the skull of a Neanderthal as a football," she says. This sports analogy goes a step further. Like a soccer player, humans are lean and well-suited to running. Neanderthals have stocky statures and barrel chests, more like the stereotypical football player. Because of this, Neanderthals were better adapted to colder weather than ancient humans who originated in the tropical climates of Africa. 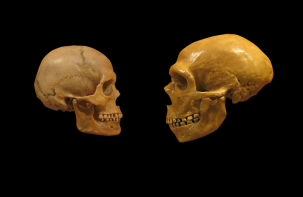 A human skull on the left, versus a Neanderthal skull on the right. Credit: Wiki Commons. "What you likely know about Neanderthals," Papagianni says, "it's that they're supposed to be stupid." This is a tough rap, but archaeological research suggests they were advanced enough to make clothes and build fires, which would have been critical to survive the cold weather. They also used stone tools. Additionally, based on the size of their skulls, the brains housed with them were likely large enough to warrant some form of language capability. 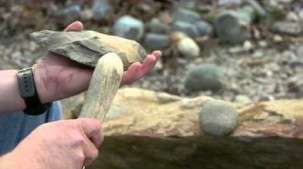 This language hypothesis is supported by modern experiments that show learning how to make and wield stone tools required some form of verbal instruction. Papagianni laughed as she described the experiment. Groups of graduate students attempted to learn how to make stone tools with and without verbal cues. Even after hours of work, fashioning a working Neanderthal-style tool from stone was near impossible without some form of verbal instruction. Given their adaptation to cold climes and their advanced, albeit under-appreciated, skills, how were Neanderthals beaten out by their human counterparts? The answer lies in a combination of culture and genetics that enabled the successful radiation of humans. Humans had diets higher in energy-rich meat that could support smaller stomachs and bigger brains. They invented tools with multiple uses that could adapt to different circumstances. They had more advanced language capabilities to pass on these skills. They were smarter; one could almost say they had more culture. "And if you're smart and you can speak," Papagianni quips, "you want to go to Europe." So the humans migrated north. This is where the genetic factors come into play. 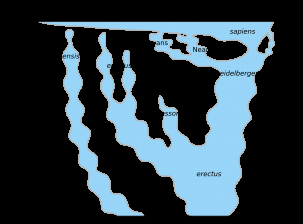 Neanderthal communities became fractured. As they grew more and more isolated, their gene pool evaporated into a spattering of puddles. This so called genetic bottleneck can lead to the demise of a species when genetic diversity gets prohibitively low. Papagianni explained the current theories for how humans were able to persist in the North at the expense of Neanderthals, but she ended on an ongoing research question: Why did humans leave Africa in the first place? Their migration could have been sparked by competition, climate change or simply a great hallmark of human nature, curiosity. Over the past 2 million years, humans have proven to be a remarkably successful species. In fact, humans are the only species on the planet with a global distribution. In order to figure out how we might fare in the future with a changing planet, it's critical to get insight from our past. The research of Papagianni, as well as the new Center for Climate and Life, will yield this essential insight into Earth's past and future, and our place within it. This story is republished courtesy of Earth Institute, Columbia University: blogs.ei.columbia.edu/ . Is this a joke? There are arguments that Neanderthals had language but one of them is not that " Even after hours of work, fashioning a working Neanderthal-style tool from stone was near impossible without some form of verbal instruction". HOURS! However Neanderthals made their tools, they had years if not decades to pick it up generation to generation. An "experiment" with subjects tells us nothing when they could not do so in a few hours. You cannot do a science of chalk by doing science on cheese. I am not sure we beat out the Neanderthals or that they went extinct. Since we have a percentage of Neanderthal DNA in us are they really extinct..? Does "beating the other out" depend on the percent of DNA? For example If one species has 49.9% and the other 50.1% is it the winner and the other extinct? There are so many things wrong with this article. Modern humans were not around 2 million years ago, so no they weren't competing with neanderthals a million years ago. Homo Sapien sapiens only emerged 200,000 years ago and made it to Europe 40-50k ago. They were smarter; one could almost say they had more culture. "And if you're smart and you can speak," Papagianni quips, "you want to go to Europe." What a weird thing to say. There are several billion Indo-Aryan speakers who would dispute this. "Humans had diets higher in energy-rich meat that could support smaller stomachs and bigger brains." That is not what I heard. In fact, I thought Neanderthals had diets higher in energy-rich meat. As a lay-person, here is my guess: Humans weren't smarter; just meaner and more devious. Finally, I have a hard time wrapping my brain around time and I often wonder if scientists don't have the same problem. Let's say one generation is X years. How many generations are there in the time frames these scientists are talking about? I can walk X miles in a day, easy, and still kill and eat and sleep. I could cover much of the planet in 20 years, dragging women and babies with me. Finally, sometimes I think it's a big planet and there is no way we could have killed off the megafauna. Especially when I'm alone. But periodically I've traveled across open plains with people and seeing them spread out abreast and marching along was an imposing sight. Has anybody looked at the role introduced diseases may have had to play in pushing the Neanderthals to the edge, there are many circumstances during modern exploration where diseases were catastrophic to the native people. Maybe the point is right there on the last map. It seems (I wonder how correct it is) that besides modern humans there was just 1 factor that beat up the other humans: geography. They don't seem to have liked traveling far away, going where no man has gone before to seek out new life for themselves and new civilizations to build. Modern humans were probably poised on doing that. And since vastness beat up other humans and modern humans beat up vastness... you can figure. No I wonder what is the connection between that appetite for travel and genetics. It's clear that modern humans were the youngest branch. Maybe they were also more genetically diverse and that was what drove them to try new places and readily adapt. Which means that as time passes and conformity settles, genetic diversity and thus adaptation probably decrease. Which may affect us already. Which may affect us already. Which is probably why we lose our lives on puny, unimportant matters like state pensions, minority rights, social welfare, 10% salary increase or getting old watching time passing by against us, instead of dreaming big and going far into space or under the seas looking for a new future. This article has got to be one of the MOST narcissistic speculations on this subject I have read yet. Humans are so so superior. How about the fact that we breed like rats making our sheer numbers dilute out the Neanderthal population to the point that all that is left is us, the modern and now even better adapted species that we were so fortunate to become. If the Neanderthals were so inferior then how come they survived for so long in even more sever environments than we ever had to? Then we come along and we were so much more superior not being nearly as adapted to such climates? Why are stupid humans so petrified at the notion that maybe we aren't as great as our profoundly narcissistic (and religious in particular) ancestry has always tried to claim. Wake up, stupid humans! We were lucky we could come across other varieties (not different species) to inter breed with. Anthropology is by it's nature always limited in the amount of actual data there is to go on. "And if you're smart and you can speak," Papagianni quips, "you want to go to Europe." OK..that one was good for a smirk. Their migration could have been sparked by competition, climate change or simply a great hallmark of human nature, curiosity. ...or they just got lost at sea.
. In fact, humans are the only species on the planet with a global distribution. Really? A lot of insects. bacteria, fungi, arachnids, rodents, etc, etc. would like to dispute that fact. ...and especially fish. There's many fish species that are vastly more spread accross the globe than humans. Just beacuse humans don't live in the oceans doesn't mean they don't count. ...or maybe flight from disease pushed a group out of Africa? To wit, evolutionary biologists suspect Nenderthals and perhaps Denisovans were Sapiens subspecies. Only ~ 2-4 % of species can interbreed despite having species barriers, and we were split off so recently. [See speciation specialist Jerry Coyne's blog.] But anthropologists don't like to find out, and they like their old fossil species def's. @rderkis: "Since we have a percentage of Neanderthal DNA in us are they really extinct..?" Well, it seems their alleles with some exceptions (local immune system variants; Tibetan height adaptation from Denisovans) are headed for extinction. They don't cope with our current circumstances well. @Gigel: "Which means that as time passes and conformity settles, genetic diversity and thus adaptation probably decrease. Which may affect us already." Not that I am a population geneticist, but I believe from reading John Hawks's articles on the subject that is what should be expected from a theoretic viewpoint, as populations gets larger more and more alleles becomes fixated or extinct since smaller fitness differences doesn't become overpowered by stochastic "noise" (random events).